Digital Mp3 Downloads Now Available! Happy New Year! We are making MP3 files of all of Heartistry Music's CDs available for download. At this time files are available for Tom Draughon's albums "Second Wind" and "Kids On The Mountain", and Indian Summer's "Aftermath". All MP3s are free of copy protection and playable forever on any and all manner of MP3 players. Thanks for supporting independent artists!! Acoustic Trio Releases New CD! Acoustic power trio Indian Summer is three excellent guitar players / songwriters with voices to match. 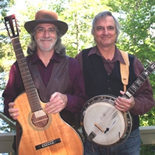 Tom Draughon first met Gary Bolstad in the early 1980s, and they have been guitar duo partners ever since. After moving to Omaha, Nebraska Gary met Ron Hulsebus at a guitar gathering where they both noticed each others' Taylor guitars. Gary's insight that all three should get together proved perfect, and the three have recorded a beautiful compilation of original songs. Their intricate, virtuoso fingerstyle guitar playing melds with Bluegrass, Beatles and other influences to create ear candy you'll want again and again. They are now scheduling appearances to promote the new CD. Sound clips available on their CD page. And, see the Heartistry Music Booking page for details on arranging a concert.